Ceboruco Volcano looms 2260 meters high above the little town of Jala, Nayarit, located 120 kilometers northwest of Guadalajara. 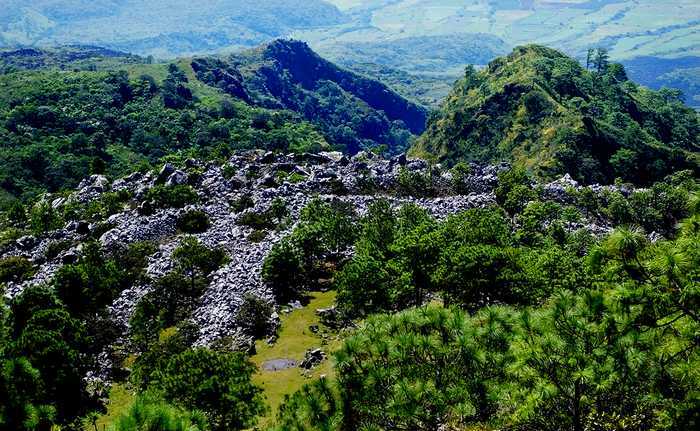 If I had a guest with time to visit only one of western Mexico’s volcanoes, I would take that person straight to Ceboruco, which is not only scenic and exciting, but boasts an access road that has been continuously well-maintained for decades. My friend Rodrigo Orozco had been dying to go there for a long time, but I recommended waiting until the rainy season ended so we could spend the night, allowing us plenty of time to hike to the volcano’s dramatic crater. I described Ceboruco in Chapter 29 of Outdoors in Western Mexico, but I hadn’t been back there in at least ten years, plenty of time for things to have changed significantly. Would I find it as fascinating as ever? Long switchbacks slowly took us to higher elevations and colder climates, until we found ourselves in a pine forest. Fourteen kilometers from Jala we came to a little side road leading down to a very long, flat meadow with fumaroles steaming out of a wall above it. A short distance further up the road, we came to the parking area, which is surrounded by several abandoned buildings. We parked and headed southwest along the trail to the crater. Beside pine trees, we also found capulines (Mexican Cherry Trees), clethras and what appeared to us to be cork trees. Most of these were covered with lichens and dripping with Spanish Moss. In the branches we spotted flowering orchids again and again. Rodrigo also showed us a most curious kind of caterpillar, the larva of the Bagworm Moth, which creeps along dragging its home with it, well decorated on the outside with miniature twigs. This beautiful and interesting trail eventually meandered its way to the rim of the crater. Down below lay a great, towering jumble of volcanic rocks from which puffs of steam occasionally wafted. From here made our way around the rim to a sharp peak offering a magnificent view of Ceboruco’s last lava flow, cut in two by the toll road to Tepic. Finally, we returned to our cars and decided to camp not in one of Rodrigo’s bucolic mini-meadows, but at the foot of the big fumaroles in the big, kilometer-long meadow further down the mountain, where we could pitch our tents right next to our cars. This night, however, there were no pyrotechnics. We fell asleep to the chirping of cicadas (totally unexpected in the Fall) and the incredibly beautiful flute-like song of the clarín jilguero or brown-back solitaire. Halfway through the night, when the temperature was only 7 degrees Centigrade, I was awakened by footsteps right outside my tent. It didn’t sound like a cow or a bull, so I decided, it must have been one of my companions on his way either to relieve himself or to warm up next to the fumaroles a few meters above my tent. But the next morning all my friends swore they hadn’t gone anywhere in the night. After breakfast, Rodrigo Orozco announced, “John I think I found your mystery visitor.” He pointed to a very narrow animal path, only 15 centimeters wide, leading off into the brush. We followed it quite a long distance and came to some huge animal droppings. I suspect we may have discovered the haunt of one of Ceboruco’s famed pumas. If you decide to camp beneath those fumaroles, keep your camera handy in the middle of the night! The map in my book is still accurate. In addition, you can check “Ceboruco Crater Trail” on Wikiloc.com, which shows you the entire route from the toll road to the crater rim. Driving time from Guadalajara to the top of the volcano is just over two hours. 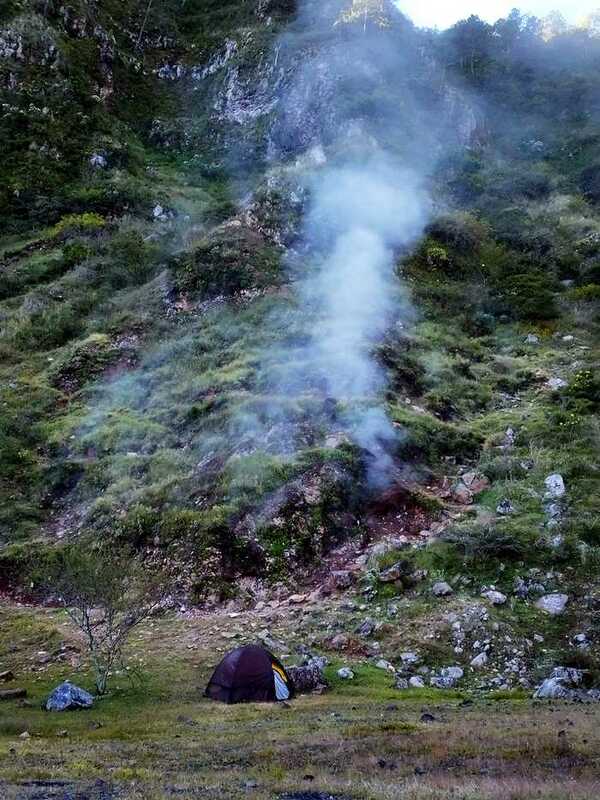 Camping at foot of the fumaroles on Ceboruco Volcano. Lava flow atop Ceboruco Volcano, Mexico. 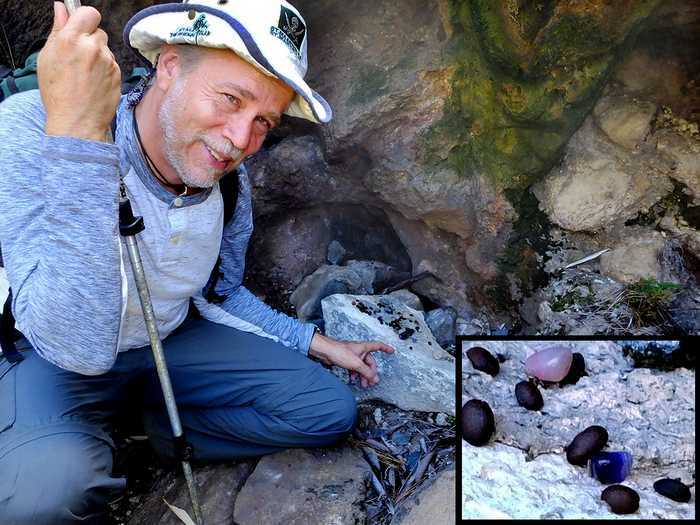 Offerings of coffee beans and smooth stones, found at fumarole opening in Ceboruco Crater. Dew view, on an early morning walk.